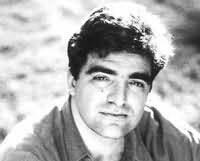 Nino Ricci is a Canadian novelist who lives in Toronto, Ontario. He was born in 1959 in Leamington, Ontario, into a family of Italian immigrants from the province of Isernia, Molise. In 1981 Ricci graduated in English literature, in 1987 he earned a second degree in creative writing and Canadian literature, both from York University. Ricci has travelled in Europe and Africa, where, in Nigeria, he taught English literature and language in a high school for two years. Ricci's first novel Lives of the Saints was a great critical and commercial success. It won the Books in Canada First Novel Award, the 1990 Governor General's Award for Fiction and a Betty Trask Award. "Kanata captures the heartbeat of a continent, in a language as visceral and raw as the landscape and lives it chronicles."